Workmanship is GUARANTEED! Handcrafted in the USA. St. James Lights are made from the purest copper in the world. Custom Designs in Copper or Steel are Welcome! All Light Fixtures are ETL Certified and all Electrical Components are U.L. Certified. Burners and Valves are Solid Brass. Other Materials used are 16, 20 and 32 ounce Copper- only the highest quality! Additional Finish Colors are available. FREE SHIPPING anywhere in the Mainland USA. The St. James Lighting Tear Drop Copper Chandelier emanates a cathedral-like quality that makes a monumental statement in your business or home! This unparalleled design features ten beautiful light fixtures on it's circular rim from the main frame of the chandelier for unmatched beauty and illumination. Copper lighting at it's finest! The Tear Drop is a one-of-a-kind copper lighting fixture, bar none! For a candle-like lighting appearance, the Tear Drop Large Chandelier are understandably a favorite choice among professional Interior Designers working with large entryways, hallways or open rooms. Unlike drum copper chandeliers or rectangular chandeliers, the Tear Drop is in a designer style class of it's own, creating BIG, BOLD statements just by its presence! Elegant lighting doesn't get any BOLDER. Modern chandeliers, like the St. James Lighting Tear Drop Copper Chandelier, enhance the looks and feel of any home or business decor theme while adding exquisite, ambient lighting. Many use this amazing copper chandelier as an outdoor chandelier for entertaining in covered patio's or decks. Its enchanting design presents metal "ribbon" arms sloping upward and downward from the circular rim to the canopy, presenting a sleek, yet strong characteristic not found in very many copper chandelier designs. The same metal ribbon design theme extends from and to the rim below, creating a striking copper and metal hemisphere appearance. The design structure is completed at the top with a scrolled metal ribbon protruding from the canopy. Tear Drop large chandeliers measure 31" wide by 37" tall. The medium chandeliers measure 24&3/4" wide by 29&5/8" tall. The small chandeliers measure 19&3/4" wide by 23&3/4" tall. Many Designers love the Tear Drop and use it for copper dining room chandeliers and copper kitchen chandeliers to meet their clients decorating needs. With its bold design, tremendous light appearance and 3 great size options, the Tear Drop Copper Lighting Fixture will complement your décor like no other can. By choosing a different finish color you can create a very vintage copper chandelier look or an antique copper chandelier look. You can even create a gold chandelier, brass chandelier or an iron chandelier look by choosing different finish colors. Create a personal statement with the Tear Drop Copper Chandelier! Copper lighting crafted by the best known name in the copper chandelier and outdoor copper lighting fixture industry, St. James Lighting. Please check out all our great copper light fixtures before you leave our store including our beautiful copper pendant lights, copper chandelier chain, copper bathroom lighting ideas, copper chandelier shades, our many copper lighting for dining room ideas, our great selection of copper kitchen lighting options as well as our huge selection of copper outdoor lighting ideas. As with all our St. James Lighting copper chandeliers we SHIP FREE to the mainland USA and we have unbeatable prices and low prices on brand name copper chandeliers as well as our low price guarantee. We are one of the top home improvement sites in the country and if you have copper lighting questions just ask our Trusted Lighting Experts for help! 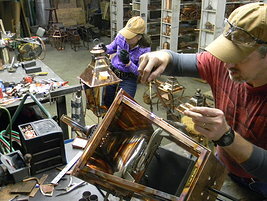 You will find many great buys on discount copper chandeliers and all kinds of copper lighting here at Teton Lighting! Interior Decorating Tips to Consider When Choosing a Chandelier. Why Choose St. James Lights? Why Choose a St. James Lighting Copper Chandelier? You get exactly what you want for your indoor and outdoor lighting needs because YOU design your light from 6 beautiful finishes, 4 glass options, 3-5 sizes depending upon the style & 5 electric options. We would like to earn your business through great customer service. I was so excited to get this chandelier and it is even more beautiful than I thought it would be! The quality of the craftsmanship of this St. James Light will make my house the most beautiful in my neighborhood. I can hardly wait to get it installed tomorrow!